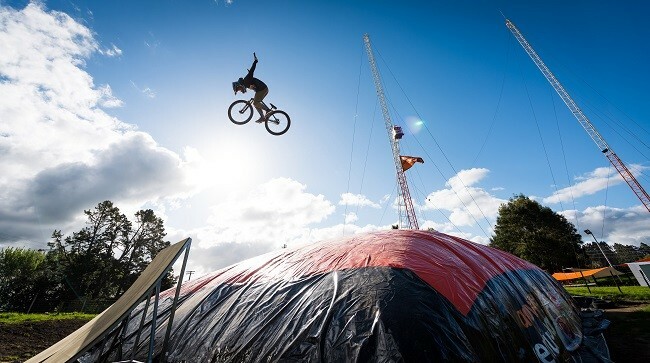 Freestyle Airbag is New Zealand's only dedicated bike airbag which officially opens this weekend at Agroventures Adventure Park. Freestyle airbag allows riders to train for freestyle tricks as they descend a hill and hit one of three ramps (beginner, intermediate or advanced) to get air. Designed for riders ranging from beginners (8yrs old and above) having a go at their first small jumps, through to free riders and international Crankworx slopestyle super stars, the airbag provides safety and confidence to progress at any level. All participants must wear a helmet (a full-face helmet is recommended), have their elbows and knees covered with clothing or elbow and knee pads. Bringing your own bike: Recommended BMX or mountain bike. All bikes will be inspected by Agroventures Adventure Park staff before use. Introductory launch price for 1-hour session this weekend only. Visit the website or call 0800 949888 for more information.